Cherries (Prunus avium) are one fruit that almost everyone seems to adore. They are one of the more extensive fruits to buy in the store, however, but diligent gardeners can grow their own. Below are a few of the varieties available for the backyard orchardist. Look for one that is suited to your specific needs. Some cherries are grown for their flowers, but if you want to harvest delicious fruit, it's important to choose the variety carefully. You won't notice significant differences in the general appearance of the different fruiting varieties -- they all have a glorious spring display of white flowers, shapely serrated leaves and attractive silvery bark -- but the fruit itself ranges from bright red to yellow to nearly black. 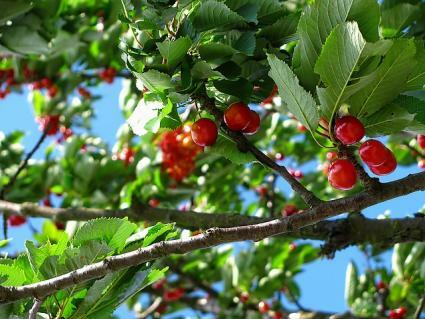 Fruiting cherries are generally grown on dwarfing roots stocks that allow them to be kept around 15 feet tall with pruning. Various rootstocks dwarf the trees to varying degrees, so be sure to check the label to see what size tree to expect. A rootstock called 'Newroot' has the strongest dwarfing effect, keeping the trees to around 10 feet, even without pruning. 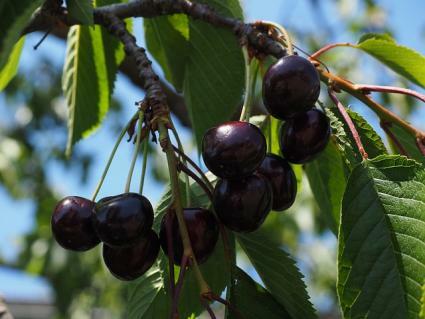 A few varieties are naturally small, regardless of their rootstock, such the Meteor sour cherry listed below. Cherry season generally runs from May to July, though the exact harvest dates vary. Plant an early, mid, and late season variety for the longest possible harvest period. 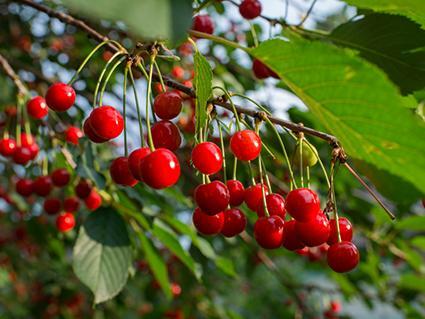 Also, most cherries are not self-fertile and require a second variety for pollination. If you're short on space, consider one of the few self-fertile varieties that are available, such as Stella. Almost all cherries are highly disease prone, faring best in areas without excessive summer rain and humidity. They are very prone to fungal problems in particular, which are exacerbated by moist conditions. Winter temperatures are another factor to consider. 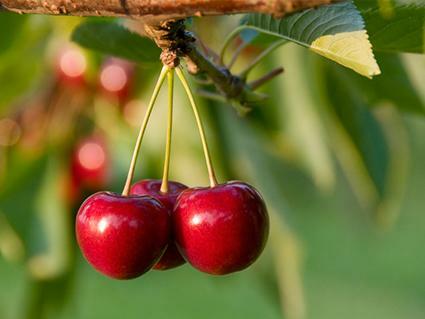 All cherries need a certain amount of winter chill -- defined as the number of hours below 45 degrees -- to set fruit. There is large variation in chilling requirements among the different varieties, so check with the nursery to make sure you're getting a variety that will thrive in your area before purchasing. Sweet cherries are wonderful for eating fresh, but they are not the best for making pies. There is no such thing as a perfectly disease resistant sweet cherry, but some are a bit more resilient than others, including the following varieties. Bing cherries are one of the most popular and well-known varieties and are commonly found in garden centers. They ripen in mid-season and are very dark red, almost black, color when ripe. Bing is a moderately disease resistant variety, but is easier to grow in the West -- in the East, however, Bing is quite susceptible to fungal diseases. While disease susceptibility is a major downside of Bing cherries, they are known for their phenomenal flavor. Possible pollinating varieties include Stella and Rainier. Bing requires 700 chill hours and is hardy in USDA zones 5 to 9. Stella is similar in appearance to Bing and is known for its similarly stellar flavor. Stella is also known as one of the few sweet cherries that does not require a pollenizer though fruit production is often higher with a second variety nearby. Stella is a mid to late season cherry and is very common in garden centers because it is self-fertile. Stella is moderately disease resistant, but shows particularly good resistance to cracking, which is a problem in areas with high summer rainfall. 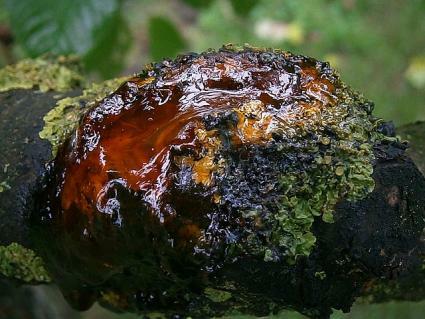 However, it is still quite susceptible to certain diseases such as brown rot and bacterial canker. It requires 400 chill hours. Stella is hardy in USDA zones 5 to 9. Rainier is known for its large fruit size and excellent quality for eating out of hand. 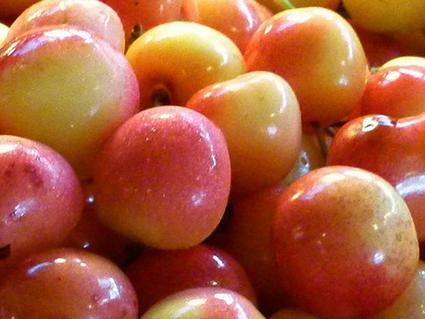 The fruit is reddish-yellow and ripens in the middle of the cherry season. It has a unique, extra sweet flavor and good overall disease resistance. 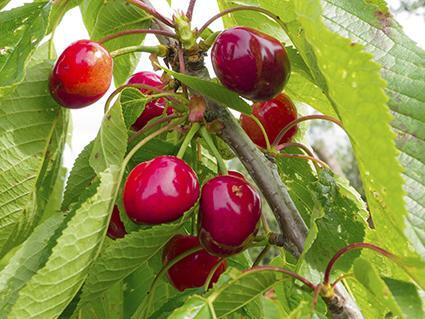 Rainier is a newer cherry that has become extremely popular and can be easily found in garden centers. It can be pollinated by Bing, Stella, and several other sweet cherry varieties. Requires 700 chill hours. USDA zones 5 to 9. Royal Lee is a sweet red cherry that is smaller in size than some of the more popular varieties, but is one of the few varieties suited to areas with mild winters. It needs to be pollinated by Minnie Lee, another low-chill variety that it is typically sold with. Royal Lee is not easily found in garden centers but can be ordered as a bare root specimen in winter from mail order nurseries. Royal Lee is one of the earliest ripening cherries and requires just 250 chill hours. USDA zones 7 to 10 are its hardiness zones. Sour cherries are not quite as popular as sweet cherries because they are not as good for eating fresh. They have a rich but tart flavor and are primarily used for cooking. The major upshot of tart cherries is that they are highly disease resistant compared to sweet cherries. They are also more cold tolerant and are commonly grown by gardeners in northerly climates. Montmorency is a popular sour cherry variety with red and yellow skin that is excellent for pies and preserves. It is known for its large size, excellent disease resistance, and heavy production. Sour cherries like Montmorency are well-suited to humid climates where sweet cherries often suffer from serious disease problems. The downside to Montmorency, like all sour cherries, is that they are a bit too tart to enjoy eating fresh. 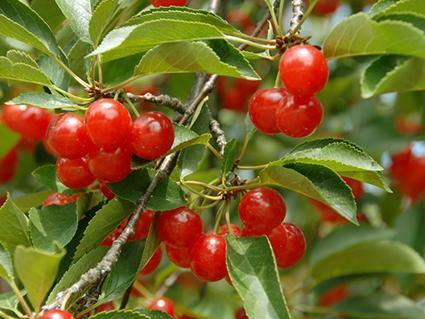 Montmorency is the most common sour cherry found in garden centers and backyard orchards. It is considered a late season variety and is self-fertile. It requires 500 chill hours and is hardy in USDA zones 4 to 9. Meteor is a sour cherry that stays smaller than most other types of cherries, reaching only 10 to 12 feet in height when mature, even without pruning. It is used mainly for cooking and is unusual in that it has clear juice. In most other respects it is very similar to Montmorency, showing excellent disease resistance and heavy production. Meteor is a mid to late season ripener and requires 800 chill hours. Plant it in USDA zones 4 to 9. Buying cherry trees while they are dormant and planting them in late winter is the best overall method. They should be planted on a slight mound unless the soil already has excellent drainage. Cherries benefit from the addition of compost at planting time. 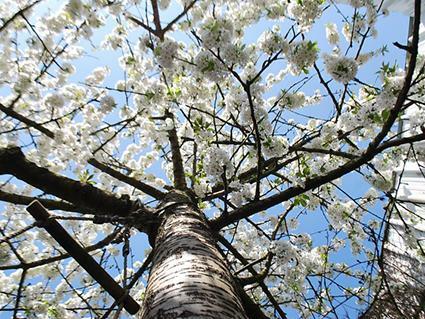 They are very ornamental trees and can be used as focal points in the landscape in place of other flowering species. All cherry varieties have similar maintenance requirements. During the growing season they need weekly irrigation whenever there hasn't been a soaking rain. They also benefit from winter pruning to remove dead and diseased wood and to keep the canopy thinned out for good air circulation and light penetration. All cherries are highly attractive to birds, so it may be necessary to cover the trees with mesh during the harvest season. The biggest maintenance activities with cherries, especially the sweet cherry varieties, are those concerned with disease management. Some pests and disease are difficult to treat, making prevention the best cure. Cleaning up rotten fruit, fallen leaves, and dead branches at the end of the growing season is a good general disease prevention strategy. Black knot - These are dark-colored growths on twigs and branches. To treat, prune out the affected wood to at least one inch below the growth and treat the area with a fungicide as soon as new growth emerges from the cut. Brown rot - This fungal disease is indicated by flowers that turn brown and drop prematurely, oozing cankers on the branches, and fruit that shrivels up and becomes covered in mold. Treat with a fungicide spray just as the first blossoms open in late spring and again a few weeks later. Leaf spot - Leaf spot appears as reddish-brown 1/8-inch spots on the foliage that eventually rot, leaving the leaves tattered and yellow. Treat with a fungicide as soon as the leaves appear in spring. Harvest your cherries once they are fully-colored and become slightly soft when squeezed, making sure to leave the stems attached. If you can ward off disease and get them before the birds do, you will be the envy of gardeners everywhere.